It is near U.S. Thanksgiving, so a good time to discuss why I am vegan. This will be part 1 of 2 posts on veganism. The food industry is terrible to animals. There is no way to deny that farm animals are sentient — we know this as well as we know that other humans are sentient. Most farm animals grow up in hellish conditions; “cage-free” is not necessarily much better; “humane” certifications are more like recommendations and are not actually binding if you read the “requirements” (e.g. chickens should enough room to “stretch their wings” — this is the same thing that the previously-discussed cage-free hens have, and anyway individual farmers can be allowed a higher density); even if humane certifications had any teeth, I do not agree with the exploitation of another living, sentient being. Meat requires more inputs, such as water, since you need a large number of plants to raise an animal. Some animal advocates do not like it when health is mentioned as a reason to go vegan, because health fads come and go. Still, I think it needs to be mentioned because so many people seem to think that it is a “me or them” situation. Veganism can be as healthy as any other diet. Meat-eating has a particularly strong causal connection to heart disease, so if it runs in your family it makes even more sense to avoid it. You can also be vegan and low-carb. Personally, I try to avoid FODMAPs for GI issues — no problem. I often hear the same set of complaints (“our ancestors did it”, “plants have feelings”, …). If you think you have an argument against veganism, please check this list of counterarguments first. Some of their comics are fantastic! More than “vegan”, I am “liberationist” — that is to say, sometimes people use “vegan” to refer only to a dietary choice rather than a philosophy, and I would like to be clear that I do not agree with the exploitation of other sentient beings. This is a hideous norm that must be stopped. I remember specifically being taught in school to use the passive voice when writing “science”. The problem is that it disguises what actually happened, and implementation details matter. That studies can be done in a vacuum might hold true for a few narrow disciplines but is generally misleading. It also constrains the future use of the data. As an example of how paucity of details can hurt, in AidGrade’s dataset, we have the year the study was published, or the year of the working paper if the paper was not published. Collaborators at Stanford are interested in matching Demographic and Health Survey (DHS) data to the geocoded interventions to investigate the long-run effects. For this, we need the year the intervention itself began and ended. More than 25% of the studies for which this was coded turn out not to have this information. Worse, when how a program was implemented matters, many studies do not report this information in sufficient detail. I would like to have a “how to write well” book to recommend to people. Any suggestions? I was thrilled that Angus Deaton won the Nobel prize. Nobody in development economics had won in a very long time, and Deaton’s prize was very well-deserved. An embarrassing personal anecdote should help illustrate: back when I was applying to grad school, I was astonished to find that he was still at Princeton because I assumed that with the large amount of work he had put out, he must be a mythical figure long since deceased. Deaton won for his work on poverty and welfare, as others have highlighted (see, for example, Chris Blattman or Tyler Cowen’s excellent summaries). More recently, he has gotten a lot of attention for his skepticism of randomized controlled trials. I am very familiar with the debate, especially due to my controversial paper which found a lot of heterogeneity in treatment effects – essentially bringing a lot of data to the debate. I think that the point that Deaton was making was more nuanced than how it is often described and applies to quasi-experimental studies as well as randomized controlled trials: that we should simply be more modest in our claims about what we know. This is very honest, and I think in the long run we will look back and wonder why there was ever any controversy over such a claim. This semester, I am teaching a small seminar class for undergraduates on economic development. The goal of the class is to write a research paper, and the syllabus is here. If you would like to follow along with the course, the webpage is here. Something a bit different: I unexpectedly came into the role of caretaker for a crayfish who had escaped from a San Francisco street food festival. I’d been invited to the fair, and while walking around we came across a crayfish, almost the length of a hand, on the road. At first, we thought he was a wild crayfish, and the immediate concern was that with all the people milling about, he would be stepped on. So I set my bag down on the ground and he wandered in. The plan was to get him off the road, find his natural habitat and release him. But then we saw the sign advertizing cooked crayfish several yards away. The little guy must have been an escapee from one of the food trucks, where he had been about to be killed and eaten. Googling, it turned out that it’s illegal to release this kind of crayfish outside — he belongs to the highly invasive P. clarkii species. Not only that, but having been raised for food all his life, I was doubtful he would know what to do in the wild. - There’s increasing evidence that crustaceans feel pain. This was heartening for me to hear, because I remember when I was in high school, the sentience line was drawn at fish — at the time, people argued whether or not fish could feel pain and largely assumed crustaceans didn’t. But it appeared to me then that the line was constantly being pushed back to encompass more and more species, and here was an example of that in action. 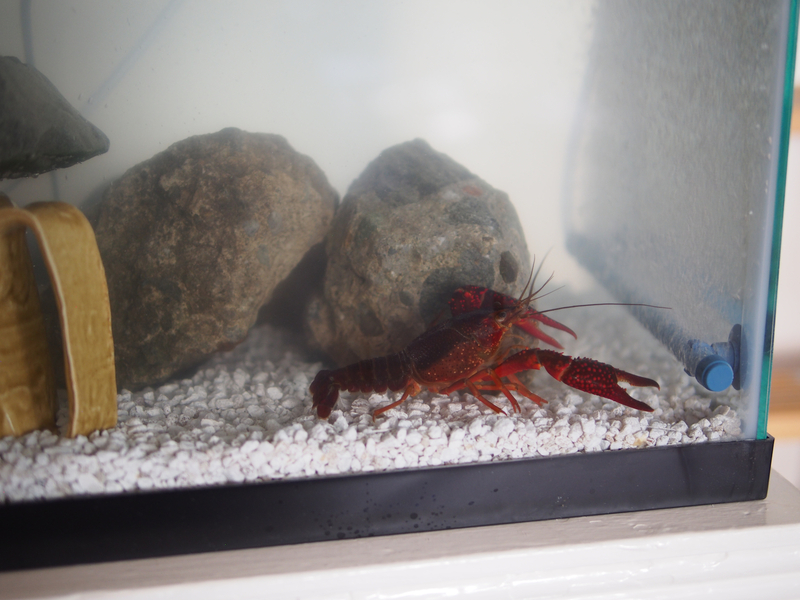 - Sammy, like most crayfish, likes to hide in his cup or between or under rocks. He will even scoot about his tank pulling his cup along with him, like a snail. He also hordes food. He eats algae wafers, frozen peas and carrots. We try to keep his tank in the dark, since he prefers that, but if disturbed, he’ll take a defensive posture over his food stash, a claw cocked and at the ready. - Crayfish can get stressed out. It’s obvious when he’s unhappy (apart from the rescue day, he doesn’t like it whenever we clean his tank). I’ve read that there’s evidence that crayfish respond to some of the same anti-anxiety drugs as humans. - He really likes to climb. He will climb everything, including trying to climb up the water filter. All in all, I really like our visitor. I can’t stand thinking what his fellow crayfish went through and the stresses they must have faced being farmed and brought to the market (among other things, crayfish are solitary creatures and will fight when in close quarters with one another, so a crayfish pile seems inhumane). I also have a more immediate response to crustaceans sold in stores, such as shrimp.